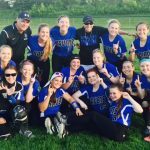 Girls Junior Varsity Softball, Girls Varsity Softball · May 19 ROHS Varsity Softball: OAA Champions! Congratulations to our 2017 Varsity Softball team and Coach Hayworth! By defeating Farmington Harrison twice last night, the Ravens clinched the 2017 outright OAA Championship! Go Ravens! Thursday, May 18, 2017 6:00 PM Royal Oak High School AWAY 8 Farmington Harrison High HOME 1 Game Recap Royal Oak got the sweep over Harrison High this afternoon. Marissa Krynak started the first game on the mound. Krynak held the Hawks to 6 scoreless innings. Krynak gave up 6 hits and struck out 8.